An artist's interpretation of NASA's asteroid-sample mission OSIRIS-REx, which will rendezvous with the near-Earth asteroid Bennu (previously known as 1999 RQ36) in 2020. The mission is expected to launch in 2016. This story was updated at 7:11 p.m. EDT. 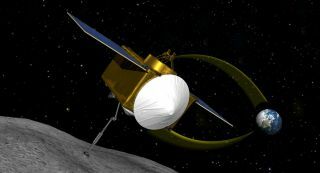 NASA will launch a sample-return mission to an asteroid in 2016, agency officials announced today (May 25). Itokawa is a relatively run-of-the-mill stony asteroid. 1999 RQ36, however, appears to be packed full of carbon-based material. If an asteroid seeded Earth with life's building blocks long ago, as many scientists suspect, it likely looked a lot like 1999 RQ36. "We're going for something rich in organics, which might have had something to do with life getting started," OSIRIS-Rex principal investigator Mike Drake, of the University of Arizona, told reporters today. "That's the idea — time capsule, containing probably the building blocks of life." There's also likely another reason asteroid 1999 RQ36 has drawn the attention of scientists: The space rock has been classified as a potentially hazardous asteroid, since its orbit brings it close to Earth in the year 2182. There is an extremely remote chance (a recent study pegs it at about 1-in-1000) that the 1,900-foot-wide (579-meter) asteroid could pose a threat to Earth. NASA selected OSIRIS-Rex as part of its New Frontiers program, which prioritizes low-cost science missions that explore the solar system. OSIRIS-Rex beat out two other finalists, a sample-return mission from the far side of the moon and a mission to the surface of Venus. Asteroids are bits and pieces left over from the solar system's formation more than 4.5 billion years ago, the dregs that didn't get swept up into the sun and planets. They therefore serve as a sort of time capsule, containing ancient material that can tell scientists a lot about the solar system's birth. Researchers hope OSIRIS-Rex will help them learn more about those long-ago days, as well the possibility that an asteroid jump-started life on Earth. 1999 RQ36 is a good study target in this regard; telescope observations suggest it contains large amounts of organics, Drake said. Pristine organics from space are hard to come by on Earth; they get scorched during their passage through the atmosphere or contaminated by the bountiful life on our planet. That's why it's so important, and so exciting, to snag some samples of the stuff from an asteroid in space, according to Drake. "We're bringing back something that's essentially untouched by human hands, has not seen the Earth's biota and will be a pristine sample of what's out there," he said. OSIRIS-Rex, meanwhile, will get up close and personal with asteroid 1999 RQ36 and return samples to Earth. But the mission has a long road ahead. OSIRIS-Rex will launch in 2016 and approach 1999 RQ36 beginning about three years later. But it won't pluck its samples immediately. Rather, the spacecraft will study the asteroid for about a year, so scientists can better understand its characteristics, choose the best sampling site and map out a good strategy. The need for such a prolonged observation period is one lesson learned from the Hayabusa mission, which had to do quite a bit of troubleshooting, Drake said. "They did not have enough time at their target asteroid, Itokawa, to really understand the environment they were operating in and safely conduct proximity operations leading to sample return," Drake said. After performing its reconnaissance, OSIRIS-Rex will gradually move closer to its sampling site, and the arm will extend to collect at least 2 ounces (60 grams) of material. The spacecraft will never actually land on 1999 RQ36. "We kiss the surface," Drake said. The acquired sample will be stored in a capsule, which will eventually land at Utah's Test and Training Range in 2023. The capsule's design will be similar to that used by NASA's Stardust spacecraft, which returned the world's first comet particles from comet Wild 2 in 2006. The OSIRIS-Rex spacecraft, meanwhile, will be redirected into a new solar orbit, likely with enough fuel to perform another mission in the future if NASA wishes, researchers said. Once the asteroid bits come down to Earth, researchers will study them to learn as much as they can about the solar system's formation and the organic molecules that asteroids may be ferrying throughout the solar system. But OSIRIS-Rex also has other potential benefits, researchers said. "The knowledge from the mission also will help us to develop methods to better track the orbits of asteroids," said Jim Green, director of NASA's Planetary Science Division in Washington, D.C., in a statement. Specifically, the mission should help scientists accurately measure the "Yarkovsky effect" for the first time. This phenomenon is the tiny push the sun gives an asteroid, as it absorbs sunlight and re-emits that energy as heat. The small push adds up over time, but it's tough to predict in detail because asteroids' shapes, compositions and rotations can vary so much. If scientists hope to predict a potentially hazardous asteroid's path, they must understand the Yarkovsky effect, researchers said. OSIRIS-Rex should help refine 1999 RQ36's orbit, allowing scientists to get a better handle on its trajectory and possibly understand how to mitigate or prevent potential Earth impacts. That could come in handy with 1999 RQ36 itself, since there's a small chance that the space rock could threaten Earth in the year 2182.